From Tromsø, drive E-8 to Nordkjosbotn and continue to Rundhaug. You may drive via Olsborgand Øverbygd or via Øvergård to Rundhaug. 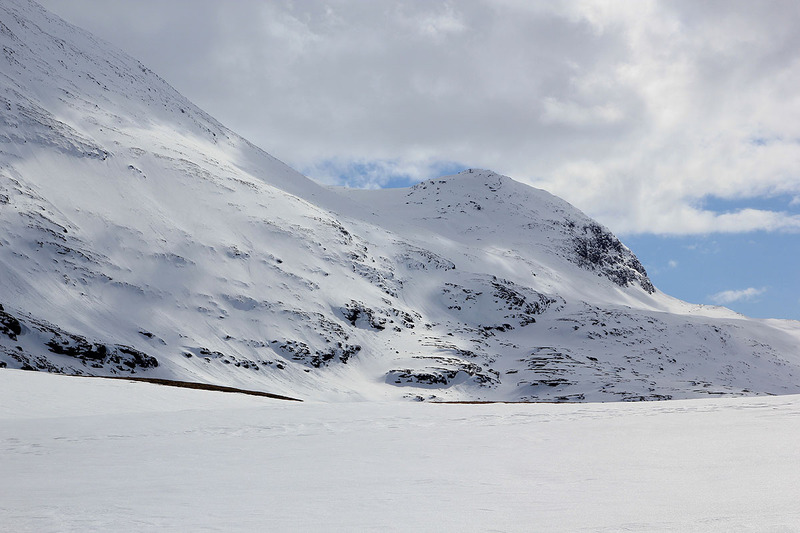 From Rundhaug, follow the road to Kirkesdalen. This valley is quite big and obviously carved by a glacier as it extends south for several kilometer. I drove to the farm Bjøkmoen and parked where the road forks, the main road going left, while a small road straight ahead serves the farm buildings. 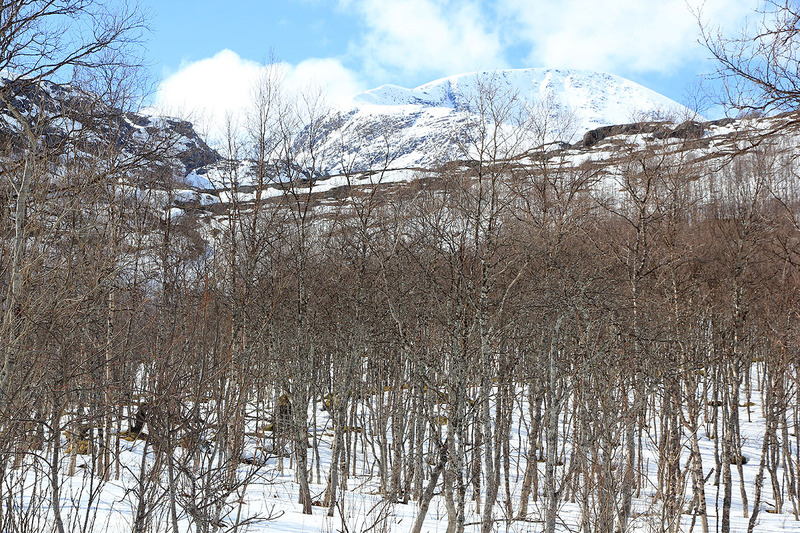 In summer, one may perhaps continue to the bridge across Lappskardelva and possibly all the way to Sauskardelva. There is also a forest road on the other (west) side of the main river, this road forks right (aross the main river) about 1.5 kilometer before you get to Bjøkmoen, I do not know if the quality (in summer) will allow you to drive even a bit further south in Kirkesdalen. The location of our parking was N68:51.931, E019:04.718, elevation about 125 meter. From Bjøkmoen, follow the farm road near the river (do not go uphill to Bjørkåsen! ), and cross Lappskardelva on a good bridge. Continue south and gradually more west as the valley curves. You will pass the place Jordbrua and then start steeply uphill while the river runs in a gorge further right. The trail climbs about 160 vertical meter before gaining flat terrain and a slight downhill before reconnecting with the river near a fork. The summer farm buildings called Hagesætra is a bit ahead on your right. Cross the river on a sturdy bridge then turn left (south) and ascend the steeper hill next to the river. 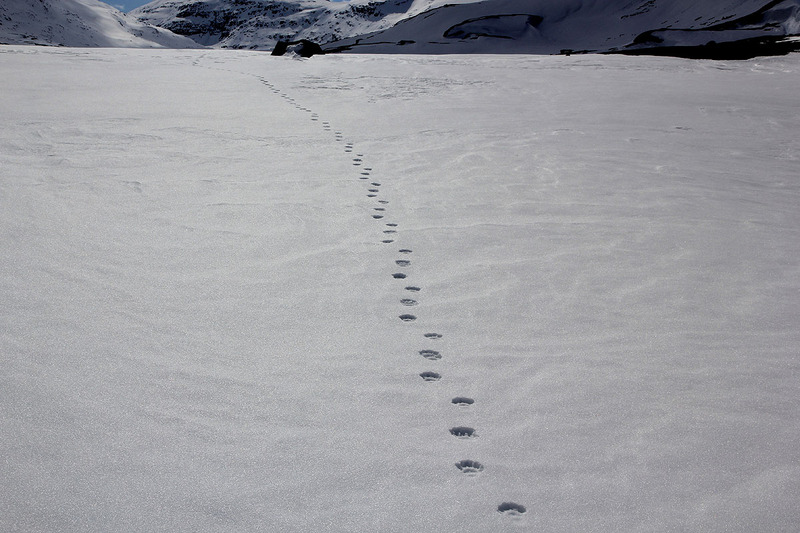 You will pass near location N68:49.225, E019:03.174, elevation 590 meter as the terrain again becomes more gentle. 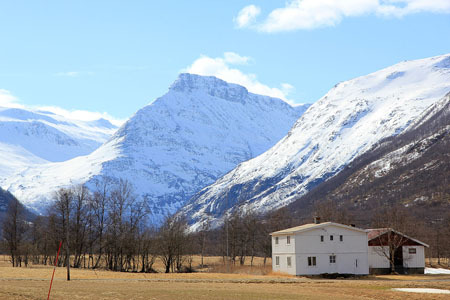 Continue south in the big valley named Altevasskardet on the map. 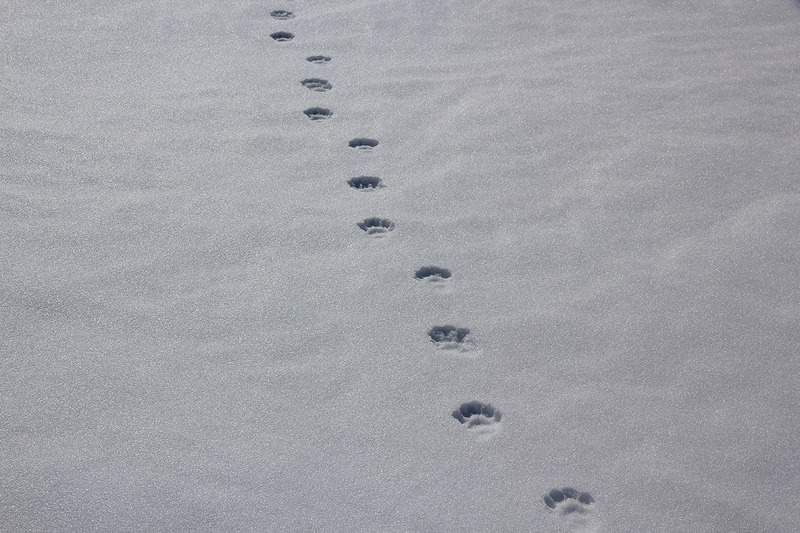 You will approach location N68:47.971, E019:03.259, elevation about 650 meter. 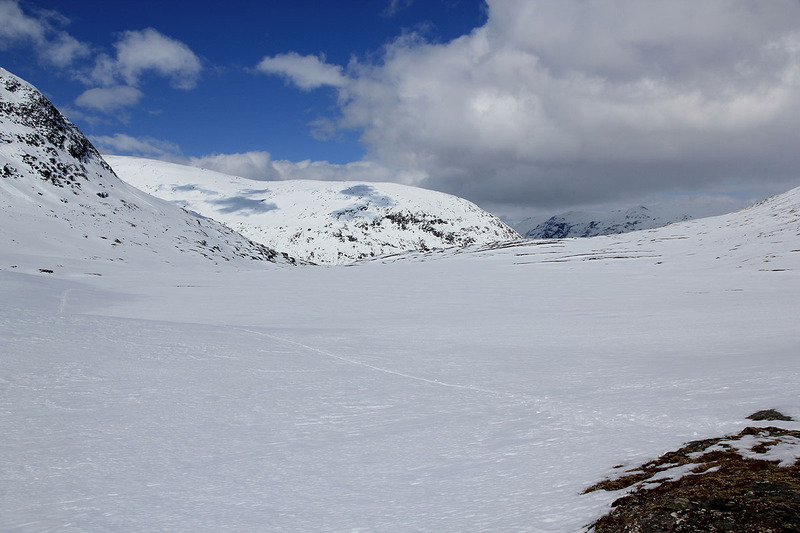 We skied up into the distinct saddle between Kirkestinden and point 1272, however, this slope had a short, but steepish section that may cause some trouble, it is also steep enough to carry avalanche danger in case of unstable snow. A better alternative is to start a gradual ascent while aiming for about the 920 meter contour as you turn the corner of point 1272, heading more east. We descended this way and it should be recommended. 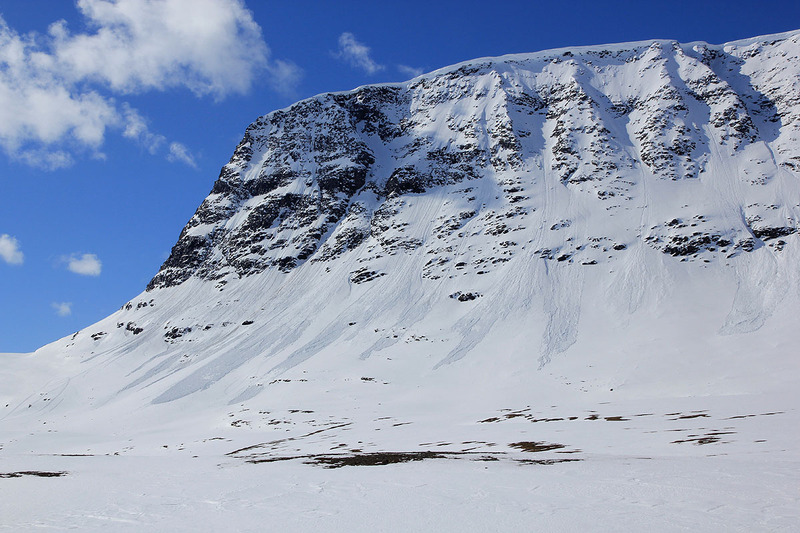 Continue into the big bowl and ascend north to the shallow saddle between point 1272 and Kirkestinden, elevation about 1250 meter. Ascend towards the east, gaining the broad ridge, then uphill, first slightly steeper, then more gentle to the summit of Kirkestinden. This is good terrain for skiing all the way. I did this climb with Sondre Kvambekk, age 21 and Åke Dahlen. 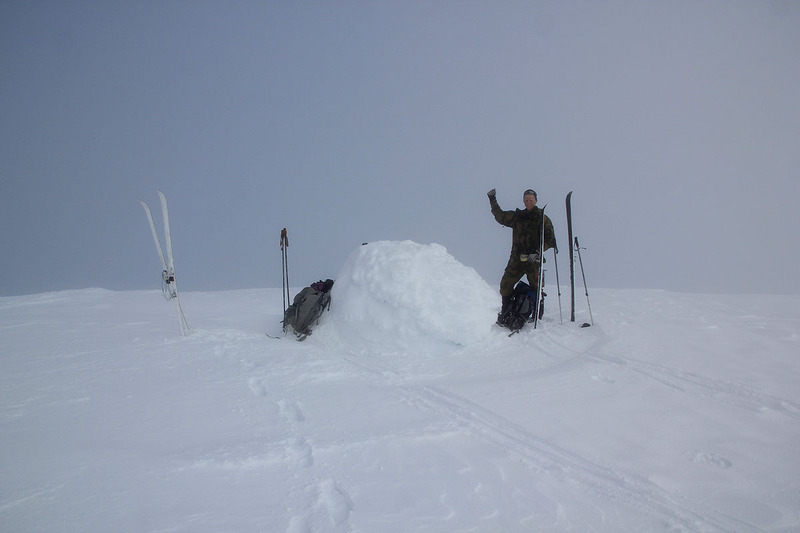 Åke and I left Tromsø around 0730 and met Sondre near his (military) camp in Bardufoss. We started out on foot by 1045 and the weather looked promising. 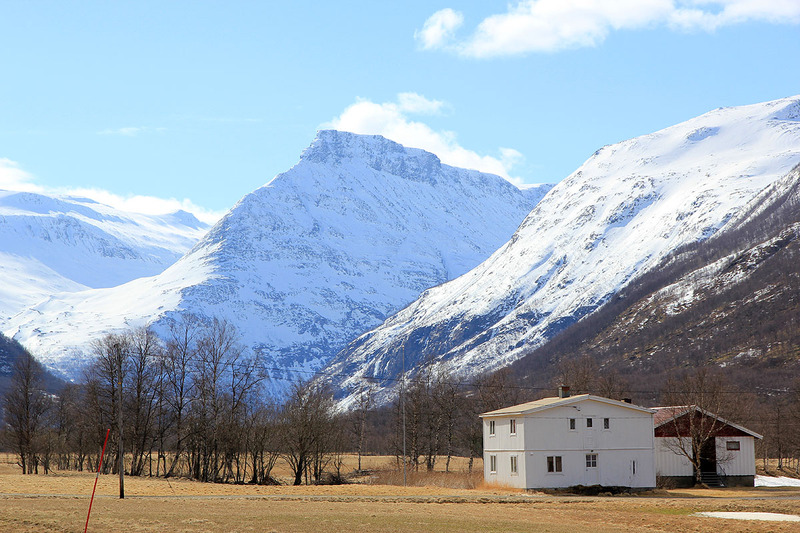 The landscape is breathtaking, the north ridge of Kirkestinden coming steeply down into the valley. 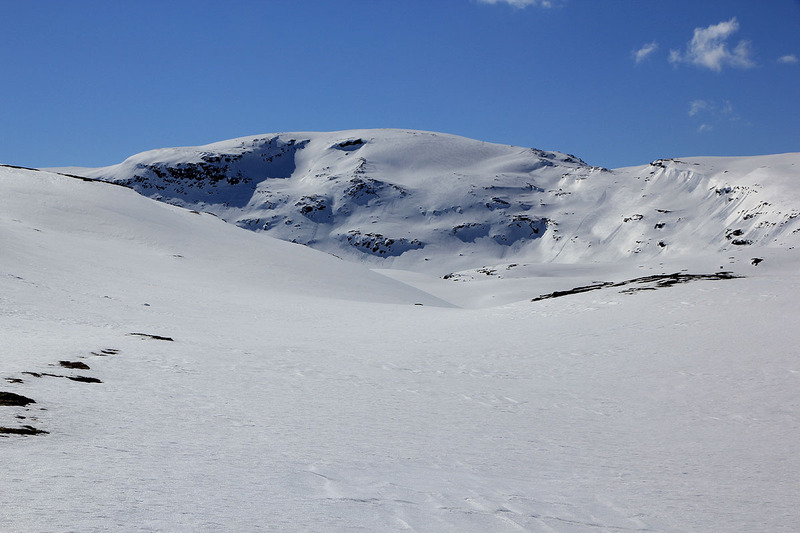 We made good progress and could put on our skis shortly after Lappskardelva. The route up to Hagesætra had a snow scooter track and the skiing further up into Altevasskardet followed a nice line. 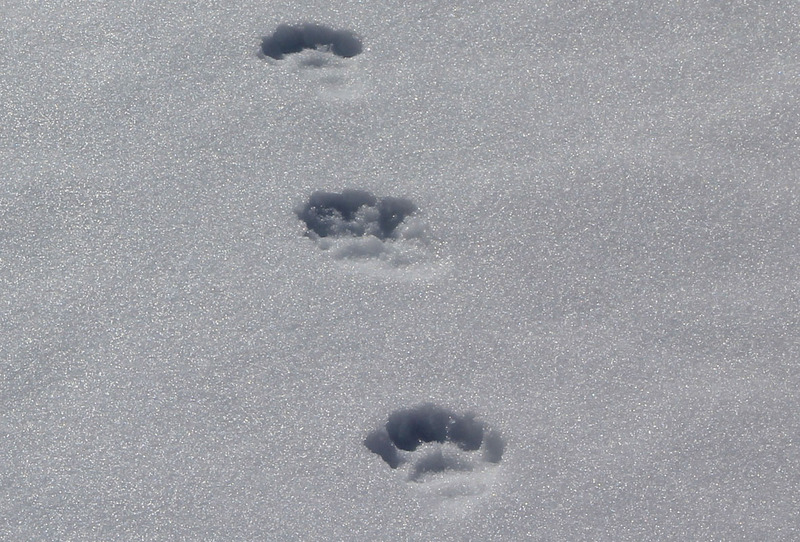 Up there, we ran into fresh footprints from a wolverine, the three steps on a line with a big paw being very characteristic. The mountain slope on our left is initially quite steep, but further in there is a col that one can reach from the south side. 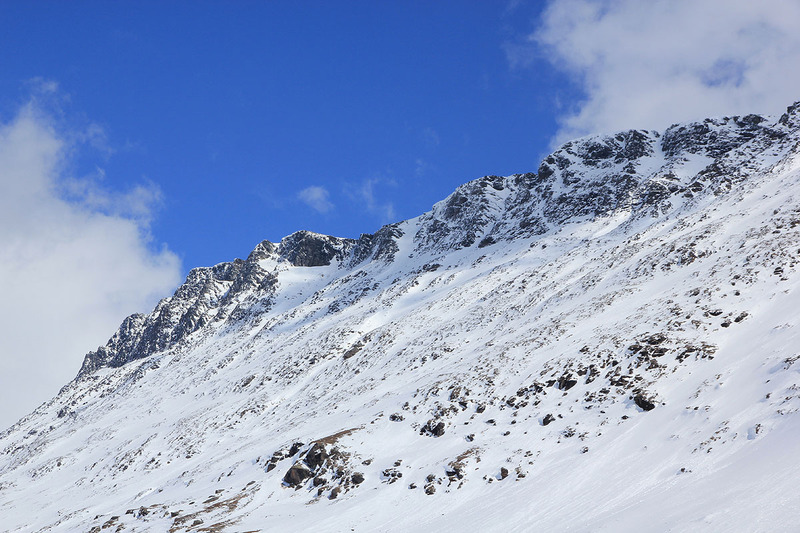 The sun was shining and the slope going directly to the col east of point 1272, looked tempting. We headed up that way, ran into a steeper slope and needed to take the skis off and kick steps up the steeper section. Overall, it would have been better to ascend more gradually and turn around point 1272 on its south side. Our ascent continued nicely and the big slope gradually fell below. 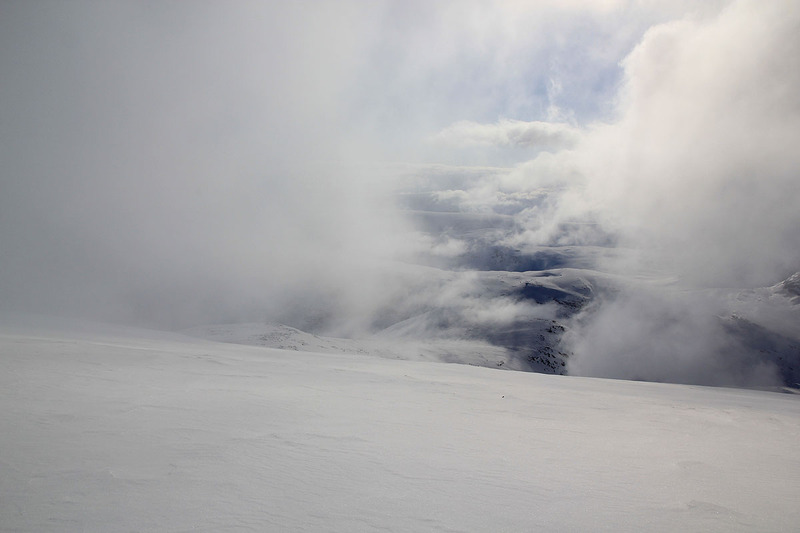 At around 1500 meter, we gradually entered a cloud and visibility became more limited. However, the fog was never really bad and we could see the sun through it as we arrived at the cairn at 1700. Thus, the view was not great from the summit, but there was no wind and very calm conditions. Descending back down, a very good view opened up towards the south to south-east, while the clouds were playing with the local tops towards the west. 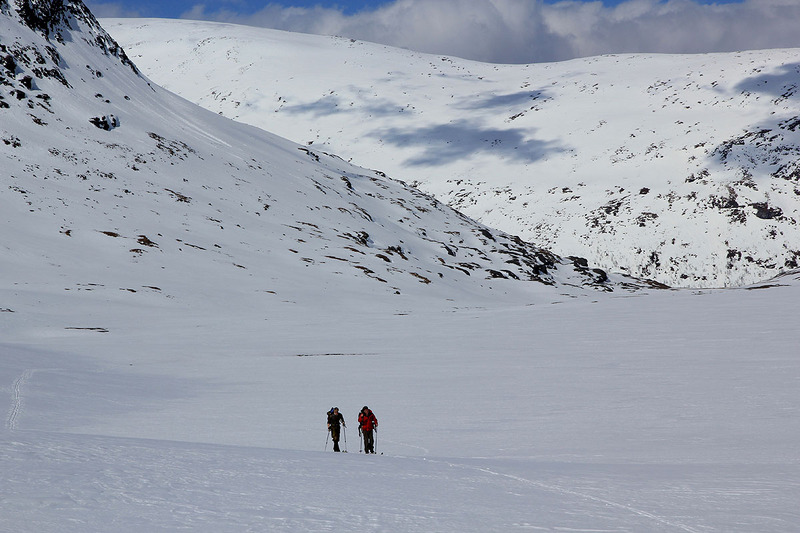 We skied down the way we should have ascended and quickly came back into the deep Kirkesdalen valley. The warm day had made the last couple of kilometer rather slushy and the valley seemed longer than it should have been. Back at the car by 2010, the sky was now overcast and the nice day had come to an end. Thanks to Sondre and Åke for very good company on a long and very nice skitrip into what is really the interior of Troms. A look back while ascending.